Croquembouche is a actually a traditional French dessert. The name stems from croque-en-bouche, which means 'crunch-in the-mouth'. It is a wedding, baptism, first communion classic. There are basically 3 main parts to this dessert, the choux pastry (the only pastry that has a cook base! ), pastry cream (creme patissiere) and to top it all off, the spun sugar! The spun sugar is actually caramel threads which bind everything together. Sometimes the choux pastry are covered with chocolate ganache or with glucose (you'll see that in MasterChef Australia's Croquembouche 2012) but we'll keep it simple this time! I got all excited this morning to make this, however we decided to go out for lunch when I had already prepared the choux pastry and returned late in the afternoon. So, I ended up tossing it off..just a bit! What I want to say is that make sure you have time by your side to get the most out of this recipe. Start by boiling the water and the unsalted butter in a pan. Let the liquid become frothy. Add the flour. Mix well. You will notice it will take no more than 30 seconds for the mixture to form a ball and leave the side of the pan. 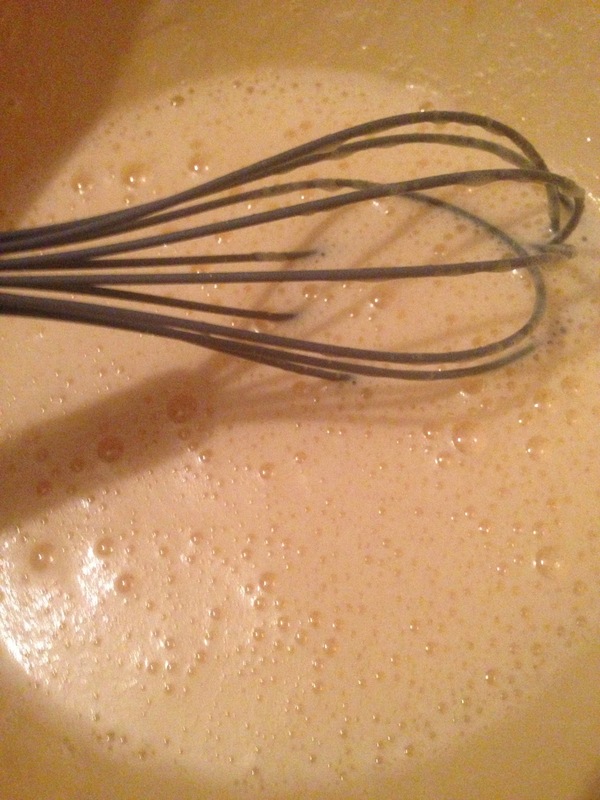 Add the eggs one at a time and stir vigorously with a whisk until the eggs are well incorporated. You should get a soft batter like this. Spoon the batter in a piping bag with a big nozzle. Pipe small mounds onto a baking sheet or baking tray with parchment paper. Bake the choux pastry for about 30 minutes or until they are golden brown and puffed. After baking allow them to cool on a rack. 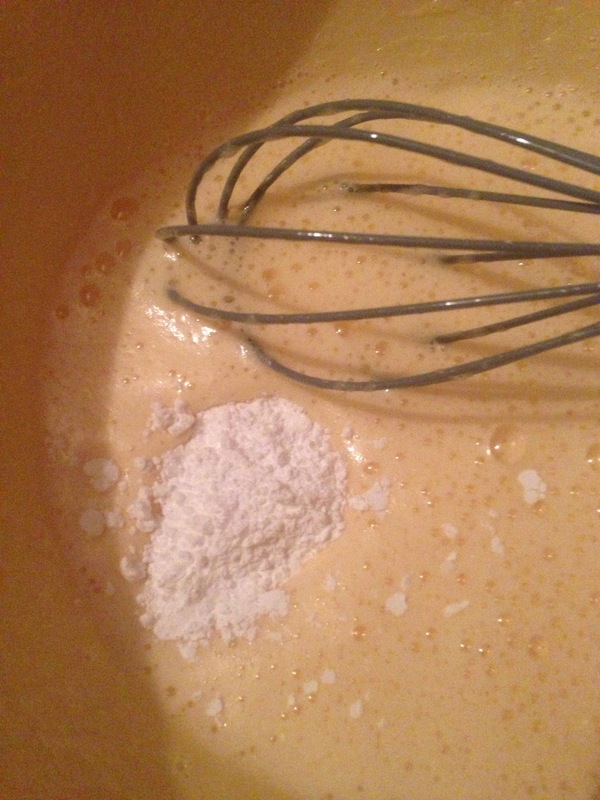 Whisk the eggs with the sugar until frothy. Boil the milk and allow it to cool until warm. Add the corn starch to the eggs and beat until well mixed. Slice open the vanilla pod, scrape the beans offs and add to the egg mixture. Add a little of the milk to the eggs. Mix well quickly. You do not want to get eggs lumps (cook the egg by adding all of the milk). And then add all of the milk. Put the mixture to boil again. Let it cook until becomes creamy, soft and smooth in texture. Allow the cream to cool. 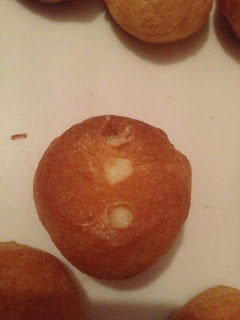 Spoon into a piping bag with a small nozzle and pipe into the choux. You can make three holes to make sure they are nicely filled in. Make a tower with the filled pastry. Let the spun sugar melt in a pan until it becomes a soft liquid caramel. Be careful as to not burn the caramel. Remove the pan from the heat. Let the caramel thicken. This will take a minute or less. 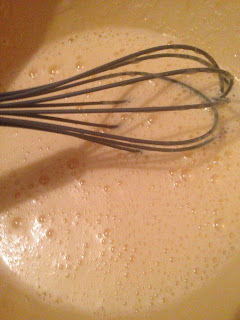 Then dip-in a fork, and spread the caramel over the choux pastry. You can alternatively cut open the choux and using a small flat knife/spatula, spread in the cream. I have used dark brown sugar for the spun sugar, that is why it looks brown. You should be fine with making the spun sugar clear with white granulated sugar.